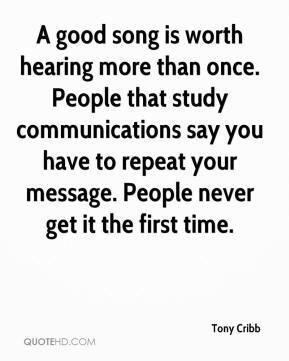 A good song is worth hearing more than once. People that study communications say you have to repeat your message. People never get it the first time. 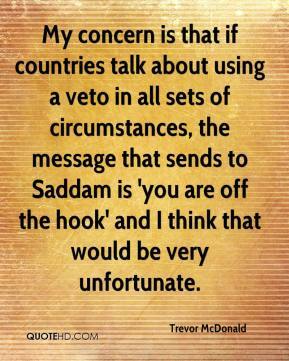 My concern is that if countries talk about using a veto in all sets of circumstances, the message that sends to Saddam is 'you are off the hook' and I think that would be very unfortunate. 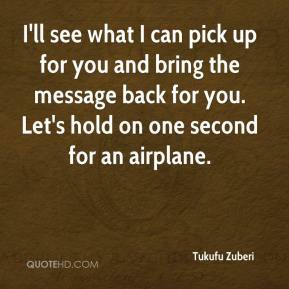 I'll see what I can pick up for you and bring the message back for you. Let's hold on one second for an airplane. 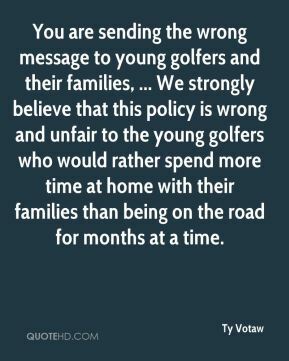 You are sending the wrong message to young golfers and their families, ... We strongly believe that this policy is wrong and unfair to the young golfers who would rather spend more time at home with their families than being on the road for months at a time. The message coming out of this government session, beyond the prayers and hope, is that the government functions. 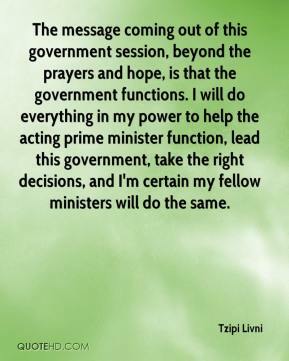 I will do everything in my power to help the acting prime minister function, lead this government, take the right decisions, and I'm certain my fellow ministers will do the same. 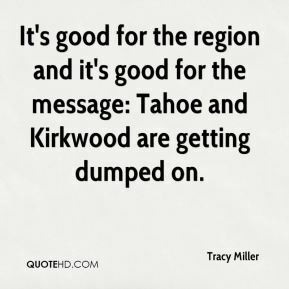 It's good for the region and it's good for the message: Tahoe and Kirkwood are getting dumped on. It's a very mixed message from the voters. 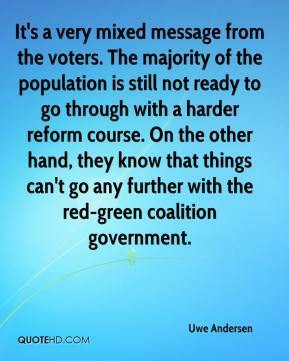 The majority of the population is still not ready to go through with a harder reform course. On the other hand, they know that things can't go any further with the red-green coalition government. 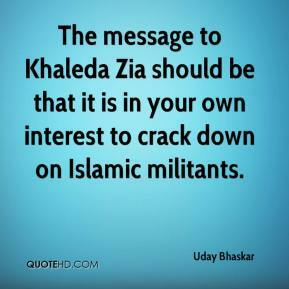 The message to Khaleda Zia should be that it is in your own interest to crack down on Islamic militants. 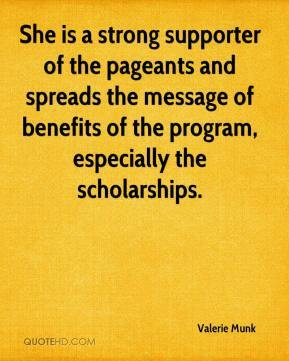 She is a strong supporter of the pageants and spreads the message of benefits of the program, especially the scholarships. 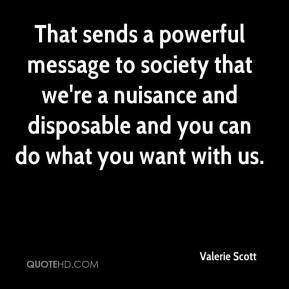 That sends a powerful message to society that we're a nuisance and disposable and you can do what you want with us. Wasteful spending is wasteful spending. 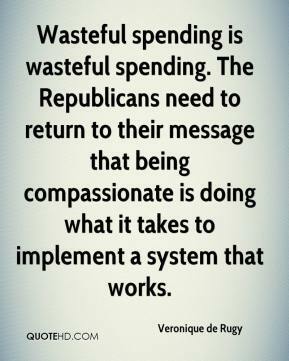 The Republicans need to return to their message that being compassionate is doing what it takes to implement a system that works. 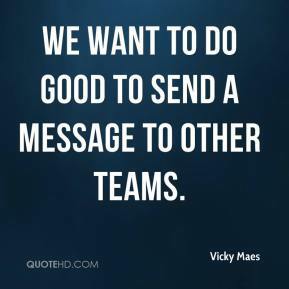 We want to do good to send a message to other teams. 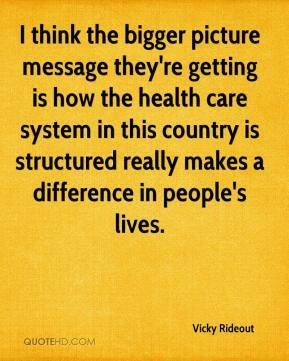 I think the bigger picture message they're getting is how the health care system in this country is structured really makes a difference in people's lives. 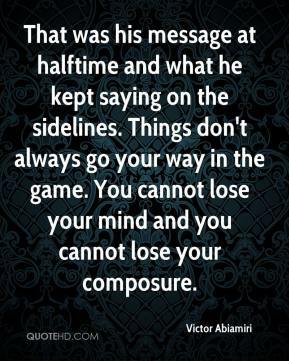 That was his message at halftime and what he kept saying on the sidelines. Things don't always go your way in the game. You cannot lose your mind and you cannot lose your composure. 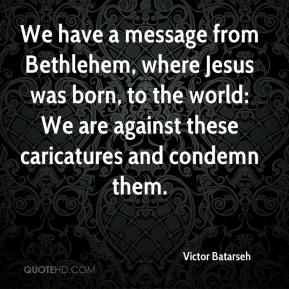 We have a message from Bethlehem, where Jesus was born, to the world: We are against these caricatures and condemn them. 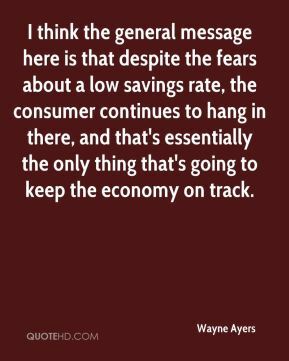 I think the general message here is that despite the fears about a low savings rate, the consumer continues to hang in there, and that's essentially the only thing that's going to keep the economy on track. Tennessee sent a strong message that Love and Action is not above the law. This dangerous and dysfunctional group should be held accountable and expected to adhere to professional standards like other mental health facilities in the state. 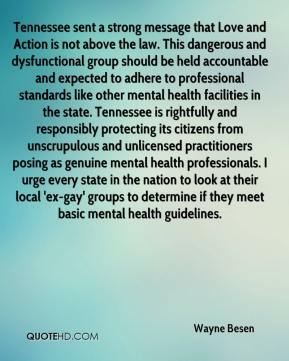 Tennessee is rightfully and responsibly protecting its citizens from unscrupulous and unlicensed practitioners posing as genuine mental health professionals. I urge every state in the nation to look at their local 'ex-gay' groups to determine if they meet basic mental health guidelines. 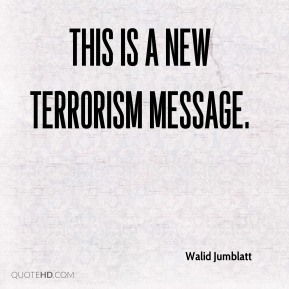 This is a new terrorism message. 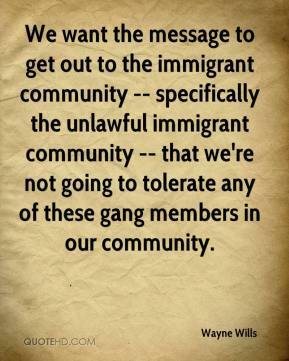 We want the message to get out to the immigrant community -- specifically the unlawful immigrant community -- that we're not going to tolerate any of these gang members in our community. 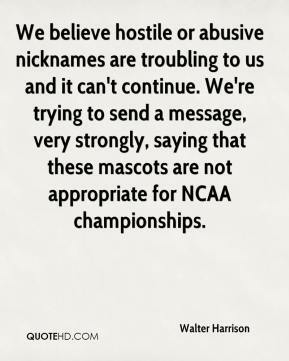 We believe hostile or abusive nicknames are troubling to us and it can't continue. We're trying to send a message, very strongly, saying that these mascots are not appropriate for NCAA championships. 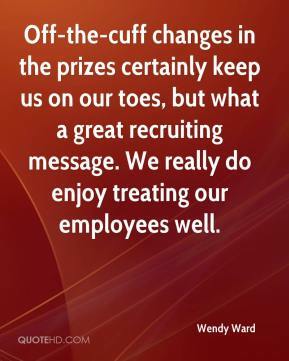 Off-the-cuff changes in the prizes certainly keep us on our toes, but what a great recruiting message. We really do enjoy treating our employees well. 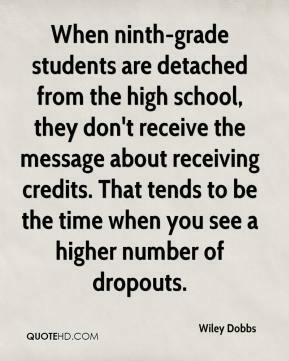 When ninth-grade students are detached from the high school, they don't receive the message about receiving credits. That tends to be the time when you see a higher number of dropouts. 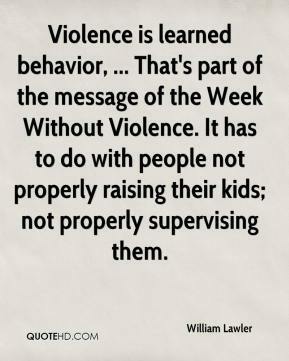 Violence is learned behavior, ... That's part of the message of the Week Without Violence. It has to do with people not properly raising their kids; not properly supervising them. 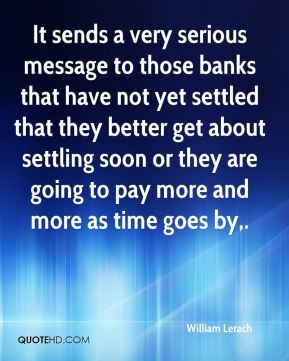 It sends a very serious message to those banks that have not yet settled that they better get about settling soon or they are going to pay more and more as time goes by. 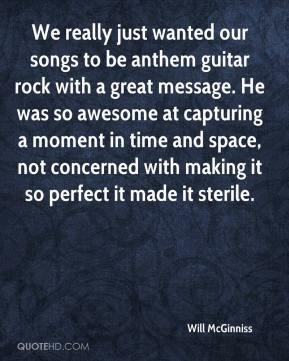 We really just wanted our songs to be anthem guitar rock with a great message. He was so awesome at capturing a moment in time and space, not concerned with making it so perfect it made it sterile.